Painting the Space Needle “Galaxy Gold,” its original color, to celebrate the landmark’s 50th birthday. ON a recent morning, as wind and spitting rain lashed the Space Needle’s observation deck, the Seattle writer Knute Berger described the World’s Fair that opened far below, in Seattle Center, 50 years ago last month. At the Chihuly Garden and Glass. “The 1962 fair was a vision of the future, with the Space Needle, the Monorail, and pavilions devoted to a ‘Century 21’ theme,” said Mr. Berger, who visited the exposition as an 8-year-old and recently published a history of the Needle. With Seattle having just embarked on the Next Fifty (www.seattlecenter.com), a six-month celebration of the fair and its legacy that runs until Oct. 21, Seattle Center is squarely in the spotlight. Dozens of temporary art installations, including a mobile pop-up gallery and performance space using a repurposed 1963 Ford Falcon van and Vespa, are planned. New guided tours cover buildings, fountains, hidden courtyards and permanent artworks like the shimmering “Seattle Mural,” a 60-foot-long abstract glass mosaic designed by the Northwest artist Paul Horiuchi for the fair and restored last year. A free audio walking tour with ’60s music and stories from fair visitors is now available to cellphones or by download. And a passel of special events — among them the exhibition “Tutankhamun: The Golden King and the Great Pharaohs” at the Pacific Science Center (May 24 to Jan. 6) and the Pacific Northwest Ballet’s November debut of a new work by Mark Morris, a Seattle native — will supplement the roster of annual happenings like Bumbershoot and the multiculti Northwest Folklife Festival. In the International Fountain Pavilion (the former Sweden Pavilion), an exhibition titled “The Future Remembered” gathers 300 fair artifacts, including some of the “Mad Men” outfits from the fair’s “Miracle of Modern American Fashion” shows. Among the 150 vintage photos is a shot of a bewildered-looking Elvis (in Seattle to film the musical lemon “It Happened at the World’s Fair”) presenting a ham to Washington’s governor, Albert Rosellini. The show runs through Oct. 21. In Center House, soon to be renamed Seattle Center Armory in honor of the building’s 1939 military origins, the once-gloomy food court will be brighter thanks to a dozen new vendors setting up shop between now and summer, including top Seattle mobile food purveyors Street Treats (build-your-own ice cream cookie sandwiches), Skillet (diner fare like burgers, and chicken-and-waffles), and Bigfood (grilled Caribbean-Indian flatbread sandwiches). And though Seattleites may claim fealty to rain and skies that are 50 shades of gray, the food court’s new outdoor deck, accessed through a just-renovated, industrial-cool space of polished concrete floors and massive steel beams, is bound to be a sunny-day hit. When art comes into a public space, it’s got to be accessible, right? And if its creators hope to invigorate a community, the experience has to operate at multiple scales, from the intimate to the universal. All this is understood by the people behind the Mobile Arts Platform (MAP), a traveling communal art space that for the past year has rolled up to neighborhood street festivals to bring art to the people, pop-up style. MAP specializes in alternative ways to experience art in everyday life. 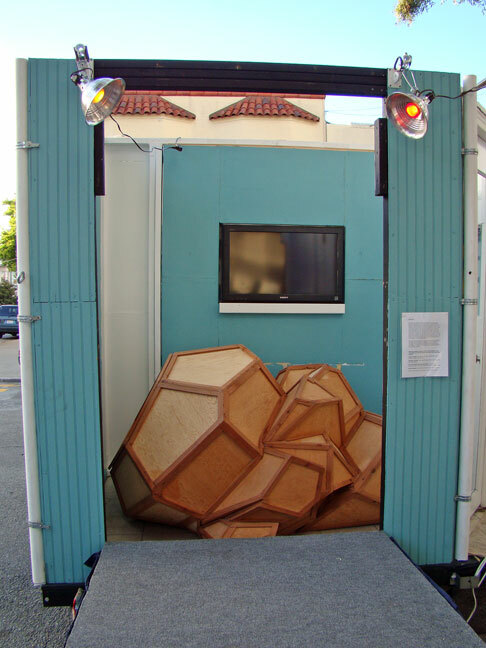 Two interactive sculptures — conceived and transported by artists Peter Foucault and Chris Treggiari — are brought to festivals and the streets outside of galleries. “It is our goal to inspire the passive viewer to become an active participant,” Foucault says. “By offering interactive projects, we invite the viewer to roll up his/her sleeves and take part in the making of an object.” At some of the neighborhood festivals, Foucault and Treggiari commissioned instructors to teach a craft, such as origami or creating stencils, and for the Potrero Festival, MAP partnered with The ‘Nabe, the Potrero Neighborhood House, to reach out to people in the community to star in a talent show. Locals are both the input and the output, making MAP a self-reinforcing platform, one that explores and expands what both art and community can be. This Sunday marks the final event in the MAP series, the Pop-Up Wrap-Up at SOMArts for a one-day only exhibition. Part retr, tective of MAP’s past year and part live art making, there will be a stenciling station by artist James Gregg, a work from Precita Eyes muralist Miranda Bergman, a ready-made picketing project, and a reading of haiku submitted by the public at the Cherry Blossom festival. Follow Jolene Torr on Twitter at @JoleneTorr, SF Weekly’s Exhibitionist blog at @ExhibitionistSF, and like us on Facebook. Million Fishes Arts Collective: Perfect Place/No Place – Re-imagining Utopia. Curated by the MicroClimate Collective. Artists: Scott Kiernan, Matthew Parrott, John Urquhart, Patick Wilson, Yulia Pinkusevich, Reenie Charriere, Brett Goodroad, Anne Schnake, Sarah Ratchye, Peter Foucault and Chris Treggiari. Review by RWM: Here is an artful agglomeration you are not likely to see anywhere else. Unusual materials used in a show which may be a bit too intellectual, but is memorable nonetheless. Big fun and odd surprises do not seem to answer all the problematic Utopian questions. Then again, they may never be answered no matter what. 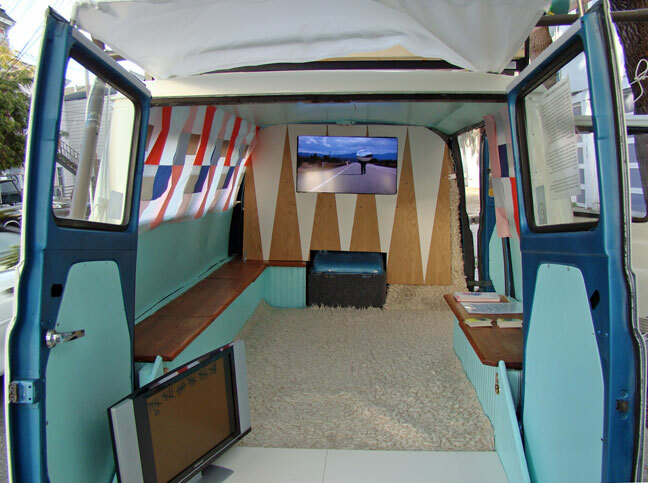 Comment by AB: Peter Foucault and Chris Treggiari’s wiggy tricked out Mobile Arts Platform (MAP) van conversion is worth seeing if you happen to cross paths with it. 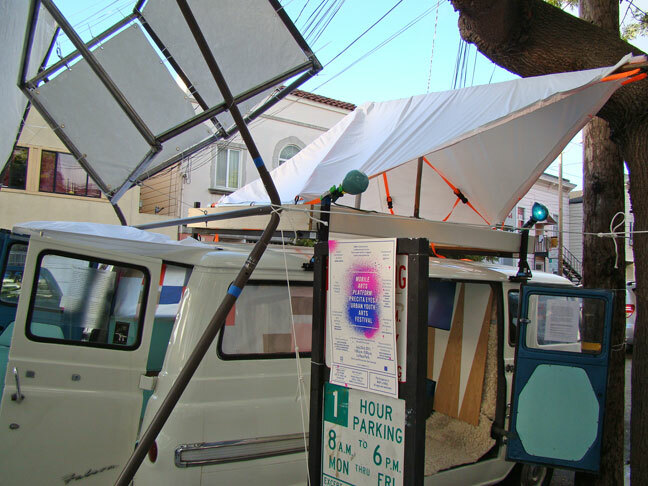 Peter Foucault & Chris Treggiari’s Mobile Arts Platform (MAP) side view. Peter Foucault & Chris Treggiari Mobile Arts Platform interior. 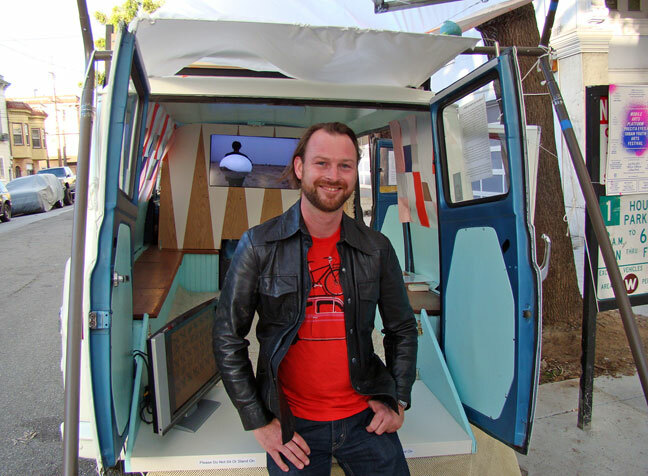 The other half – Mobile Arts Platform by Peter Foucault & Chris Treggiari. Peter Foucault and his Mobile Arts Platform (MAP).